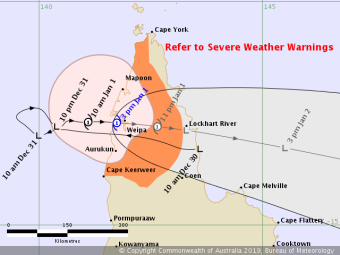 A category one cyclone has formed in the Gulf of Carpentaria. Tropical Cyclone Penny is heading east towards the Cape York Peninsula, and is expected to cross the Queensland coast near Weipa this afternoon. Bureau of Meteorology senior forecaster Gabriel Branescu said heavy rainfall was expected across the Cape York Peninsula and parts of the east coast north of Cairns. “It will be short-lived so it will move quickly over land just south of Weipa as a category one system, but still strong enough to carry 90kph winds, and gusts to up 120kph,” he said.